The ACR RT-10 is a 1970s era military issue emergency locator transmitter, more commonly known as an ELT or survival radio. Vietnam-era military pilots carried these as part of their standard gear, to call for rescue in the event of a crash landing. Nowadays, they are mostly owned by military collectors and survivalists; the 243Mhz band this radio transmits on is the same as many aircraft ELT's and is still monitored in many places around the world for emergency rescue transmissions. A single button is used for both transmission of voice and tones, with a locking lever that switches between the two modes. 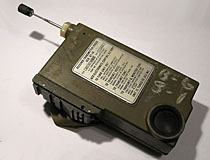 The RT-10 is powered on by extending the telescopic antenna, which trips a switch located in the base of the antenna housing. The antenna screws securely into the housing to prevent accidental activation when not in use. It should be noted that the Cospas-Sarsat ELT tracking satellite network ceased monitoring of frequencies on the 243Mhz band in 2009. This somewhat limits the utility of this device as a piece of survival gear, as the 243Mhz band is now only monitored by ground based receivers and some aircraft.